In the mid-Fifties the traditional approach to recording Country music changed drastically, owing much to the production work of Chet Atkins and Owen Bradley. Up until that point fiddles and pedal steel guitar had featured heavily in the make-up of the Country recording process and the removal of these two key ingredients, and the introduction of big lush strings and heavenly backing vocals, completely altered Country. One man who stood firm and kept the Honky Tonk flame burning was Don Law and this release shines a light on his work during the era. 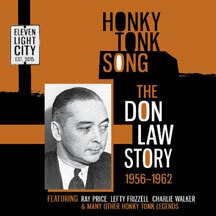 The singers and songwriters that Don Law had such a big hand in helping to success, and who feature here, would go on to become massively influential to many artists and would help to establish the Outlaw Country movement that would wrestle Country music's soul back from the ear-candy music of the Nashville Sound artists produced by Don's rivals Chet Atkins and Owen Bradley.